PC Magazine: Rating: Good (3 out of possible 5). Bottom Line: Although it’s not quite a superzoom, the Konica Minolta DiMage Z20 boasts a good 8X zoom that works well in a variety of conditions, we only wish the picture quality were better. 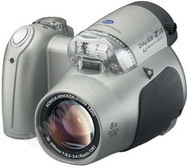 Pros: 8X zoom, very good color matching and dynamic range and flashy design. Cons: No image stabilization and tests revealed some fringing and noise in both flash and daylight shots.